The backing paper is from Peerless Designs... Simply Florals CD. The toppers are from my Daffodil Delight Digikit and the embellishments are from Pam Lefors. My word Caroline - you are an early riser. A real Springtime feel to your card and I love the three image shapes. First off the mark again Caroline and with another stunning card. Love your layout and the Daffodils certainly remind me that Spring is in the Air. That's gorgeous, it really says spring! Lovely daffodils with such a cheery feel to it all. I love your layout and the toppers combined together are lovely. 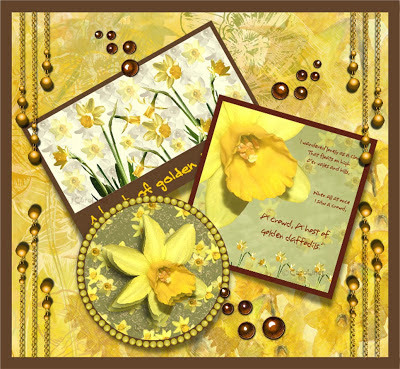 You're first again Caroline and with such a super card, daffodils are a sure sign of spring and I'm loving your layout. Thanks for your continued support of our blog and for sharing such a beautiful card with us. This so pretty Caroline with a great verse too, lovely layout just right for the challenge this week. It's lovely Caroline. The backing paper is a perfect foil for the pretty toppers. So gorgeous bright and beautiful!